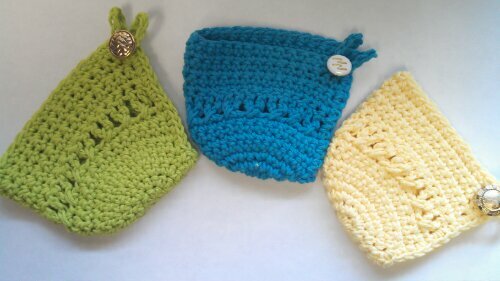 Ready for sale at Alpine Originals… Spring Green, Deep Ocean Blue and Buttercup Yellow! With only a few days left to finish the Ocean Waves Afghan Challenge,,, I have been working hard on my blanket each evening to complete it… Only a few more rows and it will be done… I will post the pictures in just a few days… It is turning out beautifully! 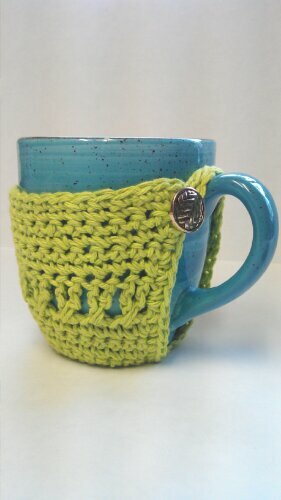 So here is to Coffee, Crochet and Challenges! I nominated you for the Super Sweet Blogging Award! Cute cup cozies! Thanks so much for linking up on Hookin On Hump Day!